Jasmine! The word conjures up exotic destinations, fragrant scents, and languorous hours lazing over a cup of delicious tea…naturally, that would be jasmine tea. Delicate and aromatic, our Jasmine Phoenix Pearls Tea brings the perfume of the Far East to The Teahouse’s cozy Canyon Road home on Santa Fe’s east side. Famed for its distinctive characteristics, jasmine tea, the best-known of the scented teas, is created by melding fragrant blossoms to a green tea base resulting in a tea both subtly sweet and noticeably aromatic. Once reserved for the Imperial Court of China, this special brew is now celebrated by all who love a gracious blend of flavors. Its refined essence led to its being served as a customary welcome to visiting guests. The particular blend offered to your table by the Teahouse is aptly named. 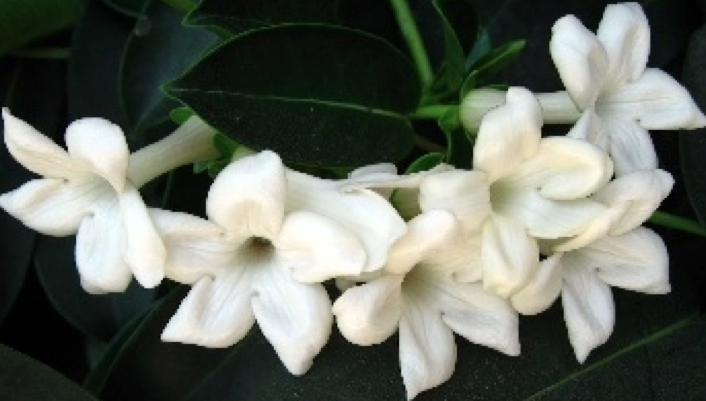 Jasmine, of course, refers to the plant, grown at high elevations in a mountain setting. The delicious scent that arises as the pot is laid on the table evokes the mythical Phoenix, the cyclically-arising bird associated with the sun, our constant companion in Santa Fe. And the mention of Pearls, historically prized jewels throughout the Orient, refers to the method of patiently hand-rolling the tea into balls that gently unfurl as they meet with hot water.. The tender young leaves of jasmine tea are picked early in the morning in spring and stored until late summer, when the plant begins to push out its fragrant buds. The flowers are harvested in late afternoon when the petals are still closed and kept cool until the early evening when the blossoms begin to open. Mixed with the tea leaves and allowed to settle overnight, the blooms slowly release their scent into the tea, a process which is carefully monitored until the tea master deems the blend ready for final drying. When a pot of this elegant tea arrives at the table, one is immediately struck by the enticing scent that arrives with it. But be patient …at least 2-3 minutes of steeping are needed to bring the tea to its full flavor potential. Since its base is a green tea, when ready to sip, the tea will not darken beyond a rich golden hue. And we’ll share a secret…all the green teas make wonderful iced teas. It’s a little-known fact that black tea becomes bitter when it cools, which is why so many people reach for the sweetener when they are served a standard iced tea. No sweetening is necessary for our Jasmine Phoenix Pearls, and if you can’t finish the pot, just let the tea cool and add ice later for a refreshing change of pace. The soft feel and unique flavor of jasmine tea means a certain amount of attention is needed to pair it with food. Adding milk is not recommended, and foods with a concentration of milk products, such as distinctive cheeses or whipped cream, mask jasmine tea’s gentle approach. Less piquant foods allow the subtle taste of the tea to remain intact. And it’s a lovely tea to enjoy on its own as you snuggle by the fireplace with a good book. We invite you to join us at the Teahouse, open daily from 9am to 9pm, to savor this fragrant delicacy of the Far East in our home or yours. To prepare at home, steep 1 tsp/5grams loose tea for 2-3 minutes in water heated between 176-194 degrees.